Citicoline is a multi-tasking nootropic that primes, powers and multiplies brain cells for better focus and attention. Citicoline National Center for Biotechnology Information. 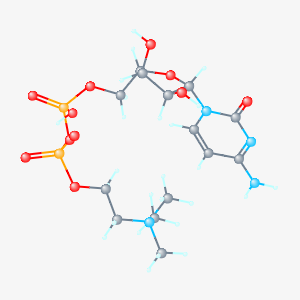 PubChem Compound Database; CID=13804, (accessed Oct. 27, 2015). Open Chemistry Database. Brain energizer. Citicoline increases brain energy reserves, improves brain energy utilization, and helps neurons “fire” with electrical impulses. Neuro-regenerative. Promotes synthesis of neural “building blocks” (phospholipids) that are used to form, repair and maintain brain cell membranes. Neuro-protective. Unlike antioxidants that fight free radicals, citicoline protects brain cells by keeping them well-maintained and well-nourished. Brain chemical booster. Signals for production and release of acetylcholine (memory), norepinephrine (attention & focus) and dopamine (alert, calm thinking). Cerebral circulation optimizer. Some of citicoline’s cognitive benefits have been attributed to an apparent ability to regulate brain circulation. How might Citicoline help mental performance? Is citicoline a “brain repair” nutrient? ost energy-guzzling organ, consuming 20% of the body’s power supply.5 It also perfectly complements Citicoline’s other activities, because brain cell creation, repair and maintenance require a lot of energy, as does the electrical impulse-driven cell-to-cell communication that enables all brain (and nervous system) activity. Energized brain = sharper cognition and better brain cell replication. 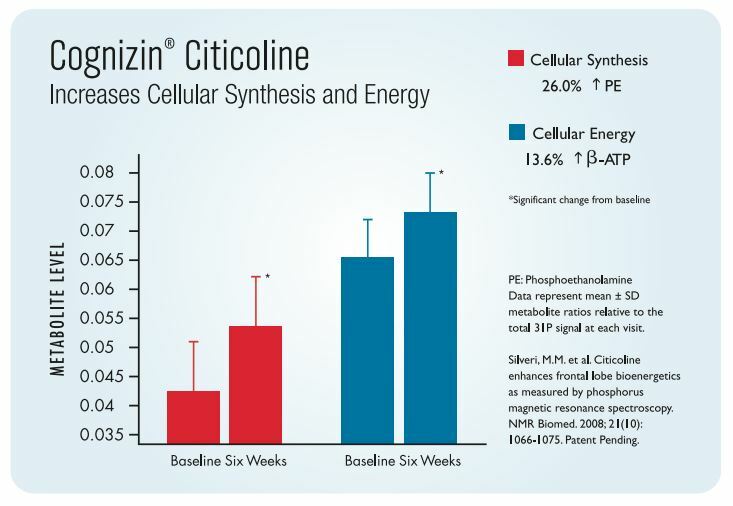 Our take: Citicoline’s brain activities are synergistic. Each of its brain benefits seems to amplify the next… and they combine to profoundly enhance the brain’s structure and function. What’s especially exciting is that citicoline’s brain health benefits are backed by promising early human research. Let’s check out some of the best citicoline studies so far. unes brain cells to improve attention span, focus and mental energy–a trifecta for peak mental performance in professional and academic settings. In older adults with cognitive decline, it seems to a rejuvenating effect on the brain: It enhances memory and may even reverse degenerative age-related brain changes. In this study, 16 healthy men and women with an average age of 47 took either 500 mg or 2,000 mg Cognizin® Citicoline every day for 6 weeks and were then evaluated for changes to their brains’ structure and function. Testing revealed a 14% increase in brain ATP (“cellular currency” for brain energy) and 35% increase in brain cell membrane turnover (repair, rejuvenation & replacement). Study subjects were given 500 mg of citicoline daily for six weeks, and then continued with either more citicoline or placebo for another six weeks. Researchers then tested subjects’ brains for photodiesters, produced during brain repair. At the study’s end, researchers reported six weeks of citicoline was associated with a 7.3% increase in brain photodiesters–but the second six-week citicoline regimen showed no further improvement. A subsequent cognitive test showed that subjects’ verbal learning performance improved as brain photodiesters increased. In a double-blind, randomized, placebo-controlled three-arm study, 60 women between the ages of 40 and 60 were administered a daily dose of 250 mg citicoline, 500 mg citicoline, or placebo for a span of 28 days, and were then were given cognitive performance tests with an emphasis on attention. At the end of the test period, both doses of citicoline were associated with better test scoring, with the 500 mg dose tied to the best mental performance. Elderly study subjects took either 500 mg citicoline, 1000 mg citicoline, placebo, or citicoline combined with a drug called nimodipine every day for 4 weeks and were tested for cognitive performance. Researchers discovered that, when compared to placebo, citicoline improved memory as “free recall,” while significantly improving word recall, immediate recall, and delayed recall. Researchers tied this result to citicoline’s neuron-regenerative properties and ability to regulate brain circulation. effectively “heal” damaged brain cell membranes by increasing synthesis of the phospholipids that are used in neural repair.10 Citicoline’s brain energy benefits may help with healing too, by generating the power that’s needed for the energy-intensive task of neural repair. nitive performance, citicoline dosage typically ranges from 1,000 mg to 2,000 mg daily. studies have reported rare, mild side effects including difficulty sleeping, upset stomach and headaches, but no major adverse events. nted in standalone supplements or in complex brain-booster formulas. Cognizin®: This “branded” citicoline is made by a patented fermentation process that produces a pure, water-soluble, allergen-free and vegetarian ingredient. It’s considered premium, and is more expensive than plain citicoline. icoline is a dynamic nootropic. It gives you raw materials to make brain cells, PLUS brain chemicals, PLUS neural energy to power brain performance. Citicoline’s bio-activities seem to work together to sharpen the mind’s competitive edge–improving productivity and performance via attention span, focus and concentration. Beyond boosting mental performance, Citicoline is brain-regenerative: supporting fast-and-efficient brain cell synthesis, maintenance and repair. We recommend Cognizin® for quality, but also because Kyowa–the company that makes Cognizin®–is a leader in citicoline research. They’ve invested a ton of money in clinical trials, and clearly believe in their ingredient. Kyowa suggests 250 mg (min.) for attention benefits and of 500 mg (min.) for mental energy and focus. Studies use bigger doses, but we suggest 250 mg to 500 mg as good a starting point to see what works for you.